George Frideric Handel (1685-1759) lived at 25 Brook Street from 1723 until his death. It was here that he composed some of his greatest works, including Zadok the Priest, Music for the Royal Fireworks and Messiah. The landmark address opened to the public as the Handel House Museum in November 2001 and is the first museum dedicated to a composer in London. I visited The Foundling Museum, Britain’s first home for abandoned children and London’s first public art gallery. It also reveals the stories of the Foundling Hospital’s founder Thomas Coram. The museum also has a section about the charity Coram, which is about adoption. 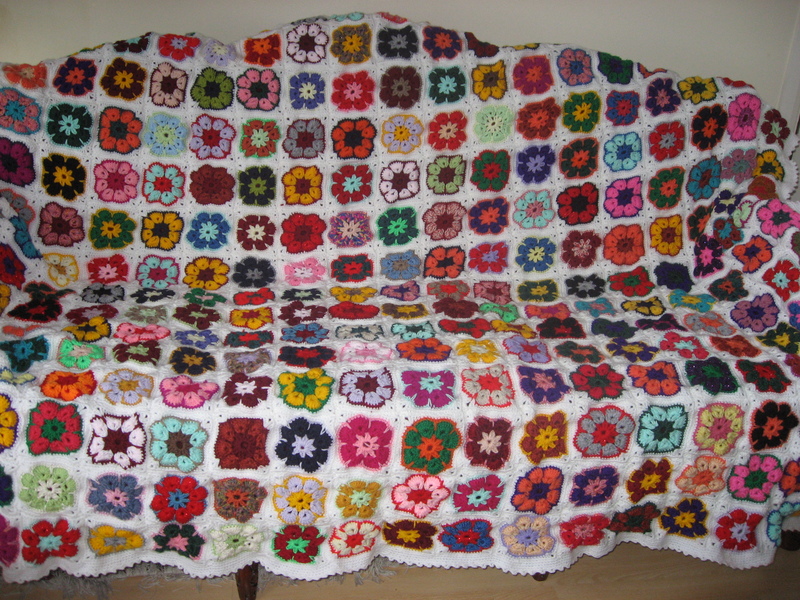 Here is my completed granny squares throw. It is made up of 300 squares. Me and my friend Isabelle visited the Zandra Rhodes exhibition at the Fashion and Textile Museum. The exhibition was very nice and it is worth visiting it if you are in London. There was some lovely bead embroidery and printed textile taken from sketch book images. I loved seeing the sketch book pages and watching the film where she spoke about drawing every day, even when she travels. I attended a lecture by an Iraqi writer/satirist called Khalid Al Kashteny, where he spoke about his experience of the golden years in the fifties from Iraq. I then went to an exhibition about Iraqi painter called Mahmoud Sabrie (1927-2012), which was organised by his daughter.